Temp agency workers have won a major victory in the fight for decent work. Legislation will soon ensure that client companies will be held responsible for any injuries or accidents faced by temp agency workers working in their companies. The Workers’ Action Centre organized to win this legislation back in 2014 with Bill 18. However, this protection was not enacted. We did not give up and now it will become law! With our growing decent work movement, we are winning better working conditions for some of the workers most hard hit by precarious and low-wage work in Ontario. This new measure, along with the equal pay for equal work law coming into effect on April 1, will strike a solid blow against exploitation faced by workers in the temp agency industry. Join the Social Media Day of Action in Support of Tim Hortons Workers. Another step forward this week was the pay transparency bill put forward by the Ontario government to address the gender pay gap. This proposed law will eventually require all employers with 250 or more employees to publish the salary on each job posting as well as report pay differentials to the government. Women workers should have the right to see how much less we are being paid so that we can enforce our right to equal pay. However, the pay transparency bill must be strengthened. In this CBC News article, Fay Faraday of the Equal Pay Coalition, says this law must apply to smaller companies with as little at ten employees, since 98% of Ontario employers have 49 employees or less. It is up to our decent work movement to build pressure and momentum so that we can improve the lives of women workers, who are making 31% to 57% less than men depending on whether they are immigrant, racialized, disabled or Indigenous women. We can find many of these women behind Tim Hortons’ counters and drive throughs. Workers at Tim Hortons, many of whom have been silenced with gag orders, still need our support as many franchises roll back benefits and working conditions. On March 15, please join the Social Media Day of Action in Support of Tim Hortons Workers. Click here right now to sign up and add your voice. If enough people join the online action, a one-time message will be sent out from all of our social media profiles to tell Tim Hortons to treat workers better. It’s so important that we bring our collective power to bear on this wealthy corporation that is treating workers so unfairly. Please get more involved in the movement and get your friends on board, too! 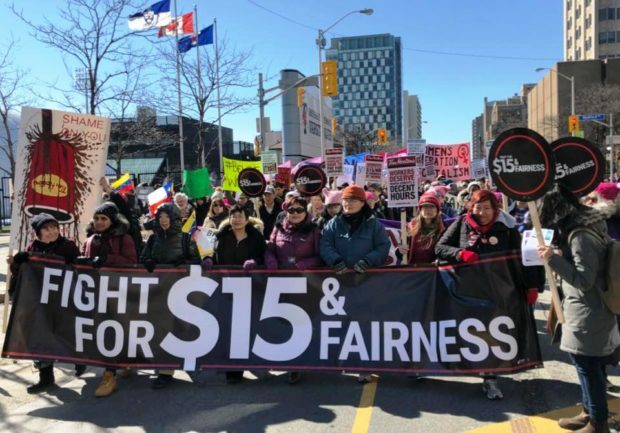 To get up to speed on our campaign and find out what you can do, come to The Fight for Decent Work Forum: From Elections to Direct Action on Friday, March 23, 6:30 – 9:00 pm at Toronto Central YMCA, 20 Grosvenor St. At this free event, special guest Bhairavi Desai, one of the founders the New York Taxi Workers’ Alliance, will offer insight on organizing for change. Please share this video and register for the event on Facebook. See you there!